What is HUM Moody Bird? 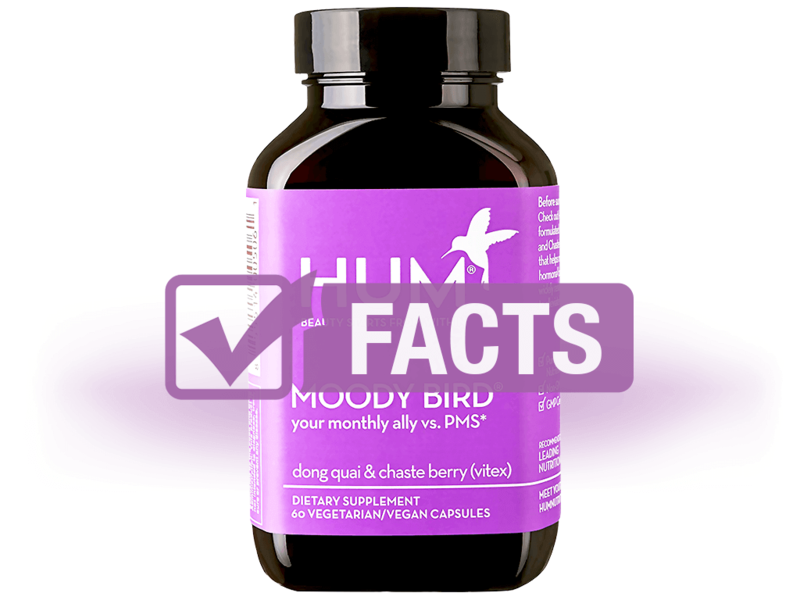 HUM Moody Bird is a dietary supplement composed of natural ingredients that alleviates a variety of PMS symptoms, such as cravings, cramps, and irritability. HUM Moody Bird uses two principal herbs to help women alleviate common symptoms of PMS, chaste berry and dong quai. 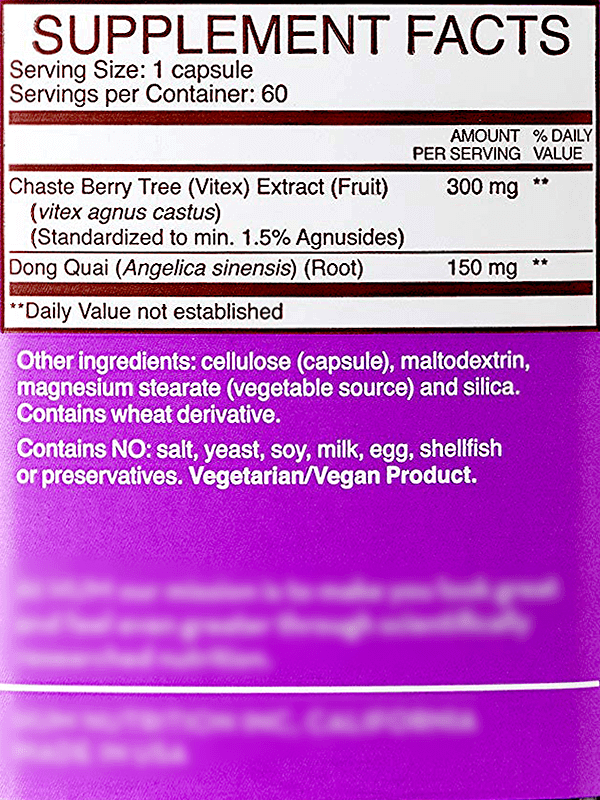 Chaste berry is a phytoestrogenic herb that has been in use for thousands of years for its effects on indirectly increasing the secretion of luteinizing hormone, thus increasing progesterone. On the other hand, dong quai is another powerful phytoestrogenic herb that balances estrogen levels to thus relieve cramps and provoke a calming effect in the body. This supplement does not contain gluten, parabens, salt, yeast, soy, milk, egg, shellfish, preservatives, or pesticides and is vegetarian, vegan-friendly, and non-GMO. If you are pregnant, nursing, or taking any other medications, please consult with your trusted healthcare physician prior to use. If the tamper seal is broken or missing upon opening, do not use. HUM Moody Bird does not openly list any short- or long-term side effects of this dietary PMS supplement. However, users on Amazon mention side effects of difficulty breathing, chest heaviness, anxiety, and cramping, among others. Positive reviews mention HUM Moody Bird relieved premenstrual mood swings, irritability, cravings, breast tenderness, acne, difficulty concentrating, anxiety, and more. Negative reviews demote the product for causing difficulty breathing, anxiety, cramping, and chest heaviness, and more. They also note the product's expensive cost, the fact that its consumption threw off their menstrual cycles, and its ineffectiveness. Positive reviews rave about the supplement for relieving PMS symptoms of cramps, bloating, depressed moods, anxiety, aches, low energy, and more. Negative reviews criticize the supplement for its ineffectiveness. Positive reviews praise the supplement for relieving symptoms of PMS and PMDD, including cramps, cravings, mood swings, breast tenderness, acne, and more. Negative reviews mention the product's ineffectiveness and high cost. No further sources of reviews present on any other website. Take one capsule two to three times daily with food. Expect results within four weeks. Keep out of reach of children. HUM Moody Bird can be purchased from the company's website, Amazon, or Sephora. HUM® Moody Bird® is a registered trademark.